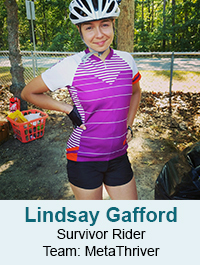 There are so many great stories about why our riders do this ride each year. Here are just a few that we'd like to share with you. Click on a photo below to read the story. 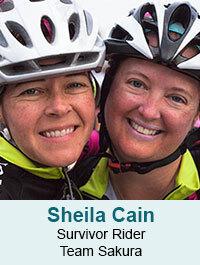 If you would like to share your Tour de Pink riding experience with others, please complete the Share Your Story form. In 2014, I was told I had breast cancer. I was 32 years old, married just 10 days before. A few weeks before our wedding, I felt the mass in my breast and my OB/Gyn told me I could wait until after the wedding to look at it. We went to the doctor 36 hours after we were married and three appointments later, I had cancer. Over the next three weeks, I learned about breast cancer at a breakneck speed. Throughout high school and college, I was independent and resourceful. As a law student, I learned to collect and absorb as much information in the least amount of time possible. 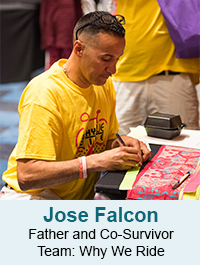 I believe all of these experiences prepared me to face cancer that month, and definitely what led me to Young Survival Coalition. I quickly found YSC’s website, and the Newly Diagnosed Navigator. I created a binder, and the questions and information within became my guide at each appointment, at every moment of doubt and confusion...and then, I met Dr. Corinne Menn and Jamie Pleva-Nickerson. These women make YSC proud! They shared their life stories with me and make me feel humbled and strong. They continue to provide an example to me of living with our diagnoses with more poise and grace than I ever thought possible, with side orders of sarcasm! I rocked my way through each step because of Corinne, Jamie and YSC. I am going to take on this 211 mile bike ride, just as I took on cancer, because I'll have these superstars by my side. My sister, Lauren, rode 200 miles with us too! She signed up two months after her own prophylactic mastectomy. After my mastectomy, my family was shocked to find the BRCA2 mutation in both of us. My cancer gave Lauren knowledge (= power!) and enabled her to have surgery before it could ever affect her life the way it has affected mine. This is the sweetest of my cancer silver linings. Another silver lining? The LIV-sponsored bike I received.! I have many incredible friends, family and even strangers supporting my $15K fundraising goal already, but I also have a wine tasting event and a cut-a-thon at my favorite hair salon in the works for this summer, so hopefully, I can surpass that goal! Tour de Pink is not just a bike ride to me. This event is a chance to honor my sister, Jamie, Corinne, Kim, Rebecca, Avery, Felicity and all the other young women I have met who are my gifts from breast cancer. And finally, I hate exercising, so this must be LOVE for YSC! My name is Jose Falcon and I am the proud father and caregiver to my only daughter, Kayla Falcon. She was diagnosed with Stage 4 Metastatic breast cancer at the age of 22 in March of 2011 as we were living in Orlando. I first heard of the Young Survival Coalition through donating to my cousin, Evelyn Hernandez’s, Tour de Pink fundraising page. However, I never thought I would be involved with YSC for my own daughter. Once Kayla was diagnosed, my cousin Evelyn had me contact a YSC staff member who immediately responded to my questions over email, on a Saturday afternoon! The moment we were in contact with YSC, we were given the best medical information but more importantly, made us feel as if we were not alone. Those early moments were magical to me and my family because it gave us hope, strength and love. As treatments were discussed, I decided to make the move to Boston while Kayla traveled back and forth from Orlando. As I was in Boston, I decided to meet with Evelyn and her TdP family in New Jersey to join her on her second TdP. I had no idea what I would be stepping into, but that day changed my life forever. I met the Team Captain of Team Why We Ride, Tony Dean, and realized how truly amazing the YSC community is and the huge impact YSC has. That day, I gained an incredible network of friends and family. I called Kayla the same day and had her fly from Florida to meet this new TdP family of mine. When Kayla arrived, she quickly came to understand that she was not alone in her fight. One woman in particular, Jamie Pleva, had a huge positive influence on Kayla. As she was speaking with Jamie, Jamie handed Kayla a handkerchief to symbolize their friendship, their pact to fight this battle together and the promise to see Kayla the following year at TdP. That weekend and Jamie brought us the greatest gifts in life, love hope and peace. I will forever be grateful for the YSC family for bringing people together for a common cause through a common sense of purpose. I dislike cancer for what it has done to my life, yet I love what it has brought to my life. It gave me a bigger family. 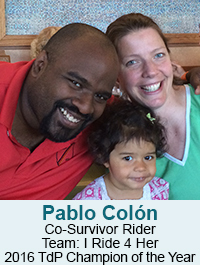 Becoming part of Team Why We Ride has been one of the most gratifying experiences in my life. This team has taught me the true value of having love for others. My brothers, sisters, cousins, nephews nieces and friends have joined me along this journey. We all came together as a family to support, inspire and encourage others that they too, are not alone in this fight. 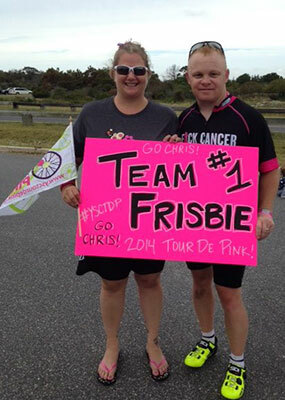 Tour de Pink is a journey of three days, touching peoples’ lives in so many ways. I was diagnosed with breast cancer in 2010. So, in early 2010 I had a bilateral (double) mastectomy with reconstruction and I moved on. No chemo. No radiation. My pathology reports showed no signs of invasive cancer so there was nothing else to do. In February of 2016, one event led to another and I found out that I had metastatic breast cancer. In July, I signed up for Tour de Pink East Coast. The weekend of September 16-18th 2016, I pulled off a crazy stunt in which I biked 211 miles. I’m honestly not quite sure how I did it. I just got on the bike and kept riding. There were times when it was hard, but for the most part it was enjoyable. The ride was very well organized and, I can’t stress it enough, it was a ride not a race. Big difference. Nobody was trying to be first (at least nobody that was biking near me). It was about finishing the ride and helping others cross the finish line. I met quite a few lovely people over the course of the weekend even when I was slower than everyone else, there was always someone to bike with. I haven’t really said much about why I chose to do this ride. Supporting YSC is a big part of that. I love what they do. Many people were riding in Tour de Pink on behalf of others. These were the people who asked me, “do you receive any support from this organization?”. They ride every year but they want to know that the money they raise is going towards good things. The answer is, yes, I take advantage of several YSC programs: I attend their support groups, I use their online resources, and I go to the conferences when I can. The biggest thing I get from them is a connection to a world where I’m not the odd one out. I’m normal and everyone around me can relate to what I am going through. The other reason I rode in Tour de Pink, which is a huge part of it, is because I wanted to overcome a physical challenge. This is just a warm-up for the kind of challenges that might be in my future. I wanted to know that if I set my mind to it, I could overcome what was in front of me. Finishing that ride was a confidence booster. I am excited to do this again next year. It was fun, inspirational, and I guess I like biking (who knew?). When I finished riding nearly 200 miles in last year’s Tour de Pink (TdP) West Coast, the panorama that greeted me at the finish line at Point Mugu was stunning: deep blue sky, the sun reflecting off sparkling water, soft sand, finishers posing for photos in front of the crashing waves. But it was the view 180 degrees from the picturesque beach that was more intriguing to me. 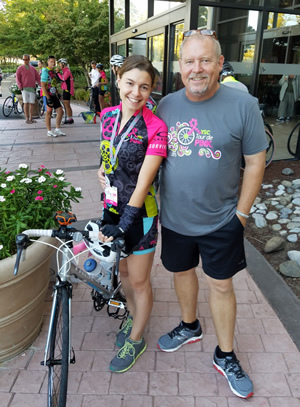 As I watched riders reveling in the glow of a challenging ride completed, I gave myself some time to compare my TdP journey with my first Tour de Pink ride the year before. My 2013 West Coast ride was nothing short of amazing, with the Pacific Ocean in view nearly the whole way. Uphill climbs were countered by the rush of a rapid descent, and foggy mornings opened up to cloudless skies. Our team celebrated with glasses of wine at the pool after hours on the road. When I crossed the finish line on day three, I was ecstatic. After months of training and hard work, I had done it. I felt a great deal of satisfaction, and couldn’t wait to sign up the next year. This year’s ride was just as spectacular, but I felt a shift in my outlook. At the starting line in Paso Robles, I noticed feeling a little different. The year before, I was focused on myself: Was I ready for this? Had I trained enough? Would I make it to the finish line? I turned to my friend and teammate, Karen. I could tell she felt it, too. We both had tears in our eyes. Choked up, we embraced. We looked behind us and saw a sea of pink-clad riders. We didn’t have to say anything to know what each other was feeling. This wasn’t just about “me” this time. This time, it was about "us". The route was challenging and the days were hot. It seemed there was a hill -- steeper than the one before -- around every corner. But this time, instead of worrying so much about myself, I opened myself up to the other riders. Normally quiet and focused on rides, I engaged with the members of the Lemon Heads -- a friendly team from Spokane whose members, despite reeling from the death of one of their own earlier that year, were so upbeat and friendly. I called out words of encouragement to riders on the tough hills, and chatted about their cute tights and fun costumes on the flats. I waited for one of our new team members at the finish line on day two, passing up the opportunity for a glass of wine and a shower to instead embrace her as she finished the most grueling ride of her life. 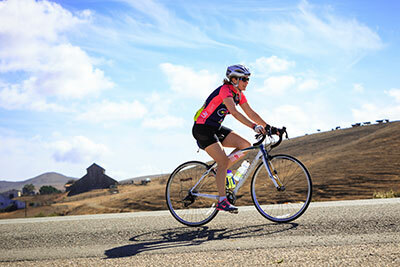 As I sat alone on a bench near the finish line of the 2014 Tour de Pink West Coast ride, I turned my back to the glistening waves and the blue sky and focused instead on what really mattered. All the riders had crossed the finish line, had lunch, and were preparing to board the bus back to Thousand Oaks. My gaze passed over each person — survivors, supporters, friends and family — and realized that every one of them had some burden they were carrying, whether it was the angst associated with their own diagnosis, doctor’s bills, sore muscles, whatever. But at this moment, they were all lost in the revelry of having completed a really tough ride together. Everyone was happy and celebrating, and forgetting — maybe just for this brief moment — all their other worries. It wasn’t about me this time. It was about us. Erin and I got married in 2010, about a year after her last surgery. 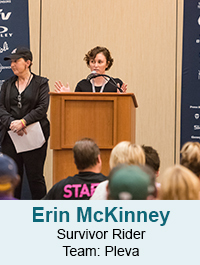 In 2011, Erin and I participated as one-day riders in our first Tour de Pink® (TdP) as a way to give back to the organization that helped us so much. The next year, I rode all three days, but Erin had to sit that one out since she was pregnant with our daughter, Dalia. In 2014, to celebrate Erin’s five year mark, we both rode all three days of the East Coast ride. 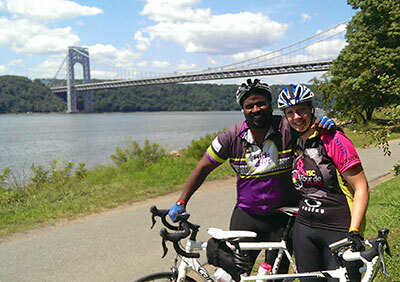 Our TdP team, “I Ride 4 Her,” has raised more than $80,000 during the past four years. TdP is really a family. We have this terrible disease in common that’s affected us all, but we’ve all come out on the other side of it stronger and eager to share our experiences with each other. My wife and teammates inspire me every day. After his friend, Kristen Martinez, told him he should do "this little bike ride," Tony quickly agreed. It was wasn't until days later that he understood that this little bike ride was over 200 miles. And he had not ridden a bike since third grade. His first ride was life changing. After Kristen's passing, it was hard for him to ride the next year. With others, he formed Team Why We Ride in 2011. And their team keeps growing. 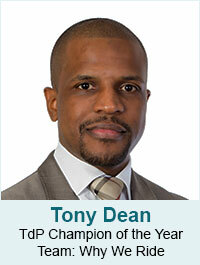 Tony and his team have raised over 250,000 in five years for Young Survival Coalition. Soon after the attacks on the World Trade Centers and the Pentagon, my wife Melody and I made the decision that I would join the Army. I was commissioned as a 2nd Lieutenant in the United States Army on October 17, 2002. My first six years in the Army, I was stationed in Germany and Italy and deployed three times to the Middle East to help do my part in fighting the global war on terrorism. I have been through some very tough times in my life including 15 months in Afghanistan from May 2007- July 2008. Those were the most difficult times I’d ever experienced until July 9, 2013 when the love of my life was diagnosed with breast cancer. I immediately felt helpless. I wanted to fix this. There was nothing I could do but sit back and hold her hand. We spent most of the first week taking turns crying on each other’s shoulder. The only thing we knew was we were going to get through this together. Melody is the most amazing woman I have ever met. We knew it was going to be a journey that would be difficult and painful. Melody would eventually undergo two surgeries and 6 weeks of daily radiation treatment. No matter how much I wanted to help, I knew it still would not be enough. I needed an outlet to help focus on in order to stay positive. I found that outlet in the YSC Tour de Pink. 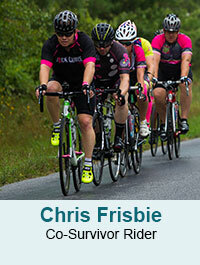 July 18th, I signed up to ride the 2013 Tour de Pink. Focusing on training for this ride and raising money for this amazing cause was exactly what I needed to constructively focus my energy. I initially did not know if I would be able to raise the funds to participate. After some reluctance, I decided to take the leap. I was amazed by the support of my coworkers, family and friends. I quickly surpassed my fundraising goal and kept pushing to raise even more money. The week of the 2013 YSC Tour De Pink, Melody was scheduled to start her radiation treatments and would not be able to attend the event with me. All she could do is meet me at the finish line. I was going to have to spend three days with 200 people that I have never met. Many were going through the difficult fight against cancer, had fought and beat the disease, and others had lost love ones to it. I could not understand how I would fit in. I really had no idea what to expect but I knew I was going to have to face it alone. It turned out to be the most amazing experience I could imagine. I met so many extraordinary people. Everybody was welcoming and immediately I felt that I was part of this organization. I was one of the three individuals asked to speak the second day of the ride. I was extremely nervous to tell our story after hearing the incredible stories of the others the night before. Afterword, it was amazing to see the tears shed and get hugs from so many. By telling our story, it gave me an opportunity to give back to YSC, and form bonds with everybody. I realized the moment I left the stage that I was now a part of the organization too. Melody is now cancer free and will continue to follow up to ensure the disease does not return. I could not take the pain from her going through all of her treatment, but I was there to provide her with loving support and care during the difficult times. We continue to fight this disease together. We rely on each other for strength and support. See you in 2016! 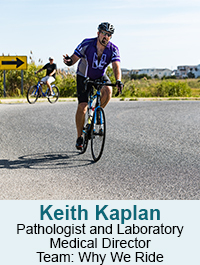 While speaking with a fellow cancer researcher I mentioned that I would be completing two 200-mile bike rides on the East and then the West Coast with several hundred other riders to raise awareness and funding for breast cancer. He questioned why I would do such a thing – ride a bike on both coasts, pedaling for hours, perhaps in poor weather or challenging road conditions, as well as shipping my bike to both locations. Then there is the issue of actually training for the ride and the harder part, raising enough funding to accomplish that goal that each rider strives towards. I answered honestly that first and foremost it was part of an overall health strategy to be more active while giving back to an organization that I believe in, the Young Survival Coalition. Still, the cancer researcher didn’t understand the premise. He didn’t see the “value” of making and taking the time to do this for the past 6 months. He suggested to me, “Next year, write these people a check for $5,000 and call it even.” Everyday thousands of surgical pathologists, such as myself, send patients on journeys that will forever change their lives. We take care to handle their biopsies, excisions, lymph nodes and clinical laboratory samples, and create pathology reports that put in motion a series of events, emotions, appointments and follow-ups that impact patients and their caregivers. As “The Doctor’s Doctor”, surgical pathologists do not necessarily see the treatment successes, failures, recurrences and remissions beyond our diagnoses. The three-day bike ride, the sun, wind and the occasional near miss with another cyclist, car or obstacle were nothing as compared to the experience after the ride. Many people were riding for someone, perhaps in honor of someone who is still alive or in many cases, someone who had passed. Some of these women did the ride a year ago and now people were riding in their memory. Standing around a pickup truck after the first day drinking cold beverages, I heard about the sisters, sister-in-laws, mothers and daughters who people made sure to remember on their bikes, their jerseys and in their hearts. Dinner as a group was filled with more stories from caregivers, families and friends. Honestly, this was harder than peddling a bike, even into a headwind, with sore legs and bottom. It made riding a bike seem pedestrian compared to what some people face with the toll it takes on their families and ultimately their life. It makes you appreciate the health you have, the ability you have to ride for others who cannot. Those 50, 60 or 100 miles are quickly forgotten when you hear about journeys that aren’t solved by shifting gears or conveniently pulling over for some carbohydrates and hydration. As a tissue pathologist, these experiences remind me that “every slide is a life” in a way you cannot see in a laboratory alone. And something I would not have experienced had I simply mailed a check and “called it even”. Our team “Why We Ride” raised over $100,000 for YSC! See you all next September!